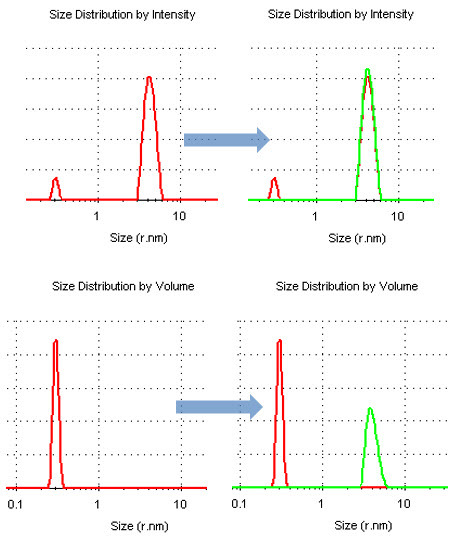 Solvent Peaks – How to get rid of the buffer/salt/additive DLS contribution? Have you ever seen a peak at small size that you think just should not be there? 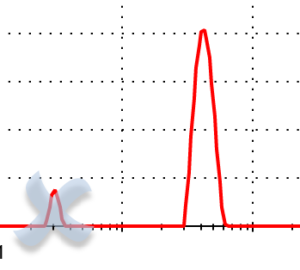 This can happen under certain conditions, and it is usually due to the signal from the buffer component in the sample. Ultimately, the high sensitivity of today’s dynamic light scattering (DLS) systems like the Zetasizer Nano has increased the observable range both in terms of concentration and size, thus ever smaller molecules can be detected (with the caveat that the required concentration has to be increased in order to see them, as the laws of physics still apply!). I just read your comment on Arg for stabilization on Malvern’s website. I hope you can help me with a concern we have with Arg. We are currently working with virus-like particles (VLP) in PBS buffer with 0.2 M L-Arg added. We consistently find a peak at about 0.8 nm that accounts for 99% of the species either in %vol or %number. The peak is present in the buffer with or without protein. The VLP in PBS without L-Arg does not show the peak. Our equipment is a Zetasizer microV, and the samples are measured at 20ºC. Have you ever seen this peak? Any hints on how to get rid of it ? We have seen the scattering from Arginine before as well. The reason it appears is that the Arg molecules do scatter enough light to be seen by the detector, and the fluctuations are slow enough to appear as a correlation function. The peak is real in the sense that there actually is something of that size in your sample (for example, see 1nm sucrose peak). Buffer components that may cause these contributions are additives such as salts, ammonium sulfate, glycerol, mannose, trehalose, glucose, amino acids. The small size contribution is also referred to by these names: solvent peak, ghost peak, salt peak, amino acid peak, sugar peak, in addition to “buffer peak”. ….and change the lower limit to 1 nm, for example. See the effect of this change in the graph below, displaying the DLS result from a monoclonal antibody prepared in a buffer with Arginine (red before editing, green after editing). The volume distribution then shows that the relevant data is still there. Alternatively, if you have the flexibility to try this, increasing the concentration of your sample particles or molecules of interest may suppress the buffer peak. Alternatively, you could reduce the concentration of the ‘offending’ buffer component – but that is not usually very practical! Bonus Tip#1: The trick described above also works for editing multiple records at the same time: just highlight all desired records, right-click edit, and place a checkmark in the box next to “Apply all analysis settings to selected measurements” under Data Processing – Measurement collection. Then all selected records will be re-analyzed with the revised display range. Bonus Tip#2: The display range can of course be made part of the SOP setup. So once this concern is spotted, the SOP can be modified to adjust the display range for further samples, and the resulting record then automatically takes these settings into account, for all samples analyzed using this SOP (as an aside: no need to worry, data can always be edited to be reanalyzed without any limits, if that’s a concern). Finally, a higher-resolution distribution algorithm like the multiple narrow mode or the protein analysis mode may increase the sensitivity towards detecting buffer peaks. The general purpose (normal resolution) mode would be the preferred and easiest choice to circumvent the issue. The different models are discussed in the technical note “Zetasizer Nano Analysis Methods Explained“. What is a narrow band filter?